News - Artisan Barrels & Tanks, Inc.
is at least equally successful---and more geographically widespread. So for us, we’ll plan on moving forward as usual with our artisan cooperages and their fine barrels, as well as with the vibrant market for large format fermentation and maturation vessels. You’ll find in our catalog our typical wide range of barrels and casks from three to 10,000 Liters. We are pleased at the continued success of our Artisan Barrels Selection French oak range. Both styles of Bordeaux barrel, Fire Bent and Steam Bent, have maintained parity in popularity, and it remains very interesting to taste them side by side. There is a 20 Euros increase in their price this year, which is on par with what most coopers seem to be doing this year due to increases in raw materials and shipping costs. 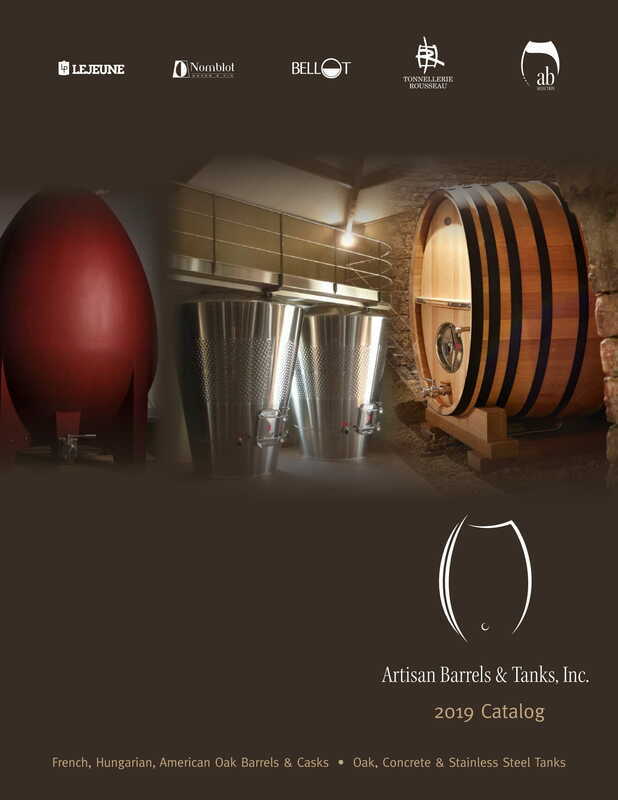 Please see the updated and increased reference list in the back of our catalog--you’ll notice an even greater range this year of wineries from all over North America using our ABS barrels. We are also very excited to be offering for the first time ABS American oak barrels. The last few years we’ve been developing a California source of excellent steam bent American oak barrels to augment our fire bent The Oak Cooperage barrels, and we’re ready this year to roll them out to our full client base. These are sophisticated American Oak barrels we’ve developed by careful blending Northern Oak forest sourcing, and using steam bending to soften the oak impact and round out the mouth feel. ​We’ve also been extremely pleased in the results of our change in the sourcing of our Artisan Barrels Selection Hungarian oak barrels. All the barrels arrived on time (in contrast to what we experienced the last few years); and the quality of fit-and-finish was as impressive as we expected. Now we are looking forward to tasting the barrels in many areas and with various types of wine to get a thorough real world experience. We are expecting revitalized growth with these fine Hungarian oak barrels, priced at $700 as well as Hybrid French (65%)/Hungarian (35%) priced at $790. Rousseau Cooperage has continued their innovation with the two exciting products from last year: the 1000L “Mini-Cask” now has a new roller-rack that uses a revolutionary new low-profile roller system (patent pending) of ball bearings imbedded into what looks exactly like a traditional oak cradle/rack. It is easy to rotate the cask, but the look is no longer industrial/metallic as with most roller racks. The system works with smaller volume casks as well, and works up to at least 1200L. ​Similarly, the Rousseau’s have moved forward with last year’s series of special and limited famous forest sourced barrels called the Hexagone Series. The Hexagone Series Barrel is a limited-edition barrel made from tight-grained oak from specific historical French forests. The barrel head has a special etching with the forest location marked on the “Hexagone” shaped map of France, and the forest will change every year, offering the winemaker a historical and organoleptic “Tour de France” over time. This year the Famous Forest will be the state forest of Bellème, one of the most beautiful forests of the Perche area of Normandy in the Northwest of France. With Nomblot Concrete Tanks, we’re coming off another year of very strong sales. Because of the popularity of its all-natural concrete formula (certified Food Grade by the French Wine Institute and in process for formal FDA approval), Nomblot will have strong demand again this year. Unfortunately for us in North America, the very large and top-quality vintage in France and especially in Burgundy has created a problem: Nomblot is still busy making tanks for their local market’s need for concrete elevage, so the production window for North America will be severely shortened. Please bear with us—we’ll do all we can to get as many tanks here as possible this year. We will continue to offer a refined range of top quality stainless steel accessories and tools from Bellot, with a focus on tank accessories, gaskets and parts. We also offer Deproma's popular barrel bilge red stain and tanks/casks varnish which is becoming very popular. The Oak Cooperage (formerly A&K Cooperage, and fully owned by Silver Oak Cellars) will happily have no price increase again this year, so we’re confident that The Oak Cooperage barrels will continue to be very competitively priced among the best fire bent American oak producers. Our Office and Sales Team is wonderfully settled and consistent for 2019: Tina Milliken will continue as Office Manager and Nicole Merciari will continue to manage logistics. Tina and Nicole are available to help with all facets of the business including accounting, barrel sales support, and wine sales. This year Gerhard Ziemer starts his twelfth season covering service and sales all over North America from his home base in Seattle, Washington. Jerome Aubin is of course overseeing the whole operation, as well as seeing his clients like usual: the Artisan Barrels and Tanks team is, as always, energized and ready to go! Emphasizing service and a dedication to better wine ageing, Artisan Barrels will continue to provide the highest quality oak, concrete and stainless steel tanks, and fine oak barrels: all reflecting an “artisanal” philosophy and approach. Since visiting wineries and tasting are essential to assess the impact of oak barrels and tanks on your wines, we look forward to evaluating the 2018 barrels and tanks with you. We wish you all the best for the 2019 vintage!